Page 24 March 24, 2014 • Law TiMes www.lawtimesnews.com ELGIN COUNTY COURTHOUSE TO OPEN e construction of the El- gin County courthouse in St. omas, Ont., is complete. e new courthouse will be home to the Superior Court of Justice and the Ontario Court of Justice, which were previously at separate locations. e court will be "fully oper- ational" on March 24, the Min- istry of the Attorney General announced. e building had been in construction since June 2011. On March 18, dignitaries including Attorney General John Ger- retsen, St. omas Mayor Heather Jackson, and Elgin County warden David Marr held a ribbon-cutting ceremony to celebrate the completion of the project. "For over a century and a half, the Elgin County courthouse has stood as a St. omas landmark. Its restoration and renovation as part of the new consolidated courthouse will preserve its stature in the community for many years to come," Gerretsen said. MAN KILLED AFTER HEATED FILM DISCUSSION HOUSTON — ankfully, stories such as this one are rare enough to classify as bizarre. A man who argued with two other mov- iegoers about the ending of a ﬁlm was struck outside the cinema by a truck driven by his ad- versaries and killed, the Harris County Sheriﬀ 's Oﬃce said last week. e men's discussion of the ﬁlm grew more heated as the three le the theatre and went to the parking lot aer the late Sunday evening ﬁlm, Reuters reported. Two of the men then got into a pickup truck. "e driver of the truck put the vehicle in reverse, striking the victim and knocking him to the ground," according to police. e truck then sped away. e victim later died at a hospital, the sheriﬀ for the Houston-area county said without iden- tifying the man. e oﬃce wouldn't name the ﬁlm but wit- nesses told KHOU-TV that it was 300: Rise of an Empire, a Greek-era action ﬁlm steeped in battle scenes. NATION'S HANGMAN AN UNPOPULAR JOB COLOMBO, Sri Lanka — It seems few want the unpopular job of Sri Lanka's hangman, but the country isn't desperate enough to turn to foreigners who have applied. According to Reuters, two Australians have applied in vain for Sri Lanka's hangman job af- ter the island nation's last oﬃcial executioner got upset on seeing the gallows for the ﬁrst time and quit. "Two Australians have sent e-mails to one of our departments saying that they are interest- ed," Chandrarathna Pallegama, commissioner general of prisons, told Reuters on ursday. "One is a system administrator and the other had not mentioned the job he is doing," he said. "We have not called the applications; moreover we do not have any provisions to recruit for- eigners." Pallegama said the last hangman, who was third most qualiﬁed among 176 applicants for the job, quit aer getting upset at seeing the gallows. According to Reuters, two hang- men chosen late last year failed to show up for work. e Indian Ocean island nation, a predomi- nantly Buddhist country, hasn't carried out an execution since 1976 despite the fact that there are at least 405 convicts on death row awaiting a ﬁnal ratiﬁcation. But an alarming rise in child abuse, rapes, murders, and drug traﬃcking since the 25- year war against Tamil Tiger separatists ended in 2009 has prompted some lawyers and poli- ticians to push for the reintroduction of the death penalty. ANNIVERSARY RUINED BY HIGH-ALTITUDE FIGHT CAYMAN ISLANDS — A Louisiana man's an- niversary went oﬀ the rails when he found him- self in police custody and paying a $600 ﬁne for a drunken argument with his wife on a plane. According to Reuters, a judge in the Cay- man Islands has ﬁned the man $600 for forcing a Delta Air Lines ﬂight to make an emergency landing aer he argued with his wife aboard the plane on their anniversary. Police escorted Michael Foret, 33, from a Delta Air Lines plane when it landed in the Cayman Islands. e ﬂight was travelling from Atlanta en route to Costa Rica. His wife remained aboard the plane and continued travelling to San Jose, Costa Rica, police said. Following the incident, Foret, who had been in police custody, appeared before a Cayman Islands judge, his lawyer, Ben Tonner, said. Foret received a ﬁne for disruptive behaviour aboard a commercial ﬂight, he said. What a way to ruin your anniversary. LT THE MOST COMPLETE DIRECTORY OF ONTARIO LAWYERS, LAW FIRMS, JUDGES AND COURTS More detail and a wider scope of legal contact information for Ontario than any other source: ȕ0WFS27,000 lawyers listed ȕ0WFS9,000 law ﬁrms and corporate ofﬁces listed ȕ'BYBOEUFMFQIPOFOVNCFSTFNBJMBEESFTTFTPGȮDFMPDBUJPOTBOEQPTUBMDPEFT Visit carswell.com or call 1.800.387.5164 for a 30-day no-risk evaluation 1FSGFDUCPVOEȕ1VCMJTIFE%FDFNCFSFBDIZFBSPOTVCTDSJQUJPOȕ0OFUJNFQVSDIBTF- .VMUJQMFDPQZEJTDPVOUTBWBJMBCMF1SJDFTTVCKFDUUPDIBOHFXJUIPVUOPUJDFUPBQQMJDBCMFUBYFTBOETIJQQJOHIBOEMJOH O N TA R I O L AW Y E R' S P H O N E B O O K Untitled-5 1 14-01-31 12:31 PM u Bizarre Briefs By Viola James u The InsIde story LAO TARIFF TO RISE Private bar lawyers who do legal aid work will get a ﬁve-per-cent tariﬀ increase starting April 1, Le- gal Aid Ontario announced. e changes are in accordance with a January 2010 memoran- dum of understanding signed by the Criminal Lawyers' Asso- ciation and the Ministry of the Attorney General. All Tier 1 private bar lawyers except those in northern Ontario will see their rate increase to $104 from $99 per hour. For Tier 2 law- yers, the new rate is $117 an hour with the tariﬀ for Tier 3 lawyers increasing to $130 from $124 an hour. Lawyers doing complex criminal cases will see their rate jump to $149 an hour. Northern Ontario lawyers will also see an increase in their rates. Tier 1 lawyers in northern On- tario will now get $114 per hour, an increase from $109. For Tier 2 lawyers, the new rate is $128 an hour with Tier 3 lawyers getting $143. ose who do complex criminal cases in northern On- tario will earn $164 an hour, an increase from $156. JAMES MORTON JOINS COOLEY BOARD Toronto litigator James Mor- ton has joined the board of directors of the omas M. Cooley Law School. Morton joins the board along with Michigan Supreme Court Justice Stephen Markman. Morton, who heads the litiga- tion group at Steinberg Morton Hope & Israel LLP, has been a long-standing adjunct professor at the U.S. law school. "I could not be more proud to welcome Justice Markman and Professor Morton to the Cooley board," said Cooley president and dean Don LeDuc. "ese distinguished gentle- men bring intellect, character, academic excellence, professional expertise, and decades of public service to Cooley. ey under- stand how providing high quality, practical legal education is impor- tant to both the legal profession and to society as a whole. ey will set a ﬁne example for Cooley's students, who will beneﬁt greatly from the perspectives they will bring to our school." POLL RESULTS e results of the latest Law Times online poll are in. According to the poll, 68 per cent of participants don't be- lieve the Law Society of Up- per Canada should allow other law schools to follow Lakehead University's approach of having graduates qualify for entry to the profession based on three years of study. Lakehead's new law school will produce graduates who can enter practice without articling or doing the law practice program. 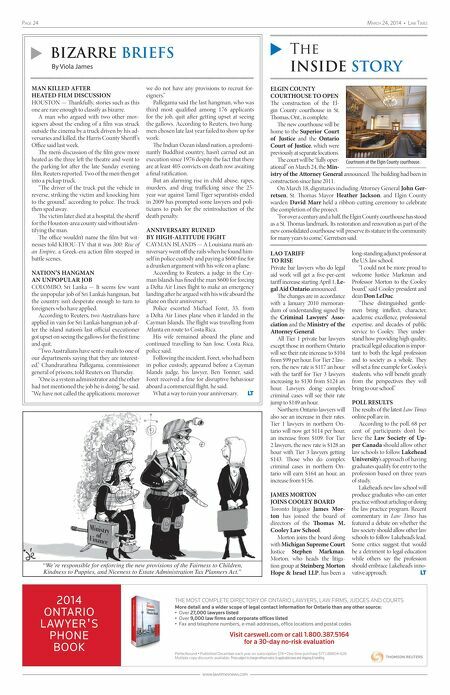 Recent commentary in Law Times has featured a debate on whether the law society should allow other law schools to follow Lakehead's lead. Some critics suggest that would be a detriment to legal education while others say the profession should embrace Lakehead's inno- vative approach. LT "We're responsible for enforcing the new provisions of the Fairness to Children, Kindness to Puppies, and Niceness to Estate Administration Tax Planners Act." Courtroom at the Elgin County courthouse.